This entry was posted in Boat Sheds, CYA Boat, Events, Sailing Sunday, Sub 28', Tales & Yarns, Yachts and tagged Gypsy, Herne Bay Yacht Club, IA12, Idle Along, L50, L52, L53, L8, M7, Marlin, Mullet Boat, Sloanes Beach Regatta & Centerboard Cup, Waione by Alan Houghton - waitematawoodys.com founder. Bookmark the permalink. Very late reply, but first of all there is no mullet boat association and secondly the mullet boat committee of the PCC does not acknowledge that the “un ballasted out and out racing 16 footer is a mullet boat.” I guess this is an assumption made because she appeared on J marina with the other mullet boats. There is a story behind this, that I won’t go into. Arch Logan and co can rest assured that there are no newly ordained mullet boats! The mullet boat owners and committee are as keen as anyone to maintain their authenticity while trying to maintain an active, racing fleet. There you go, the bona fide 13ft 3in mullet boat LADY RUIA, using the mainsail from the bona fide X Class 14ft mullet boat TORMENT. I reckon she’d bring in at least half a hundredweight of fish from the Wairoa River mullet grounds. Marginally economic, but what a blast! Came across the below 1960’s image of Lady Ruia. Described as a mini Mullet boat at 13ft 3″x 6ft 8″. Built of kauri,double diagonal and drew 4ft6″. Two bunks below. Robin, I utterly refuse to let you get me embroiled in an argument about what is a ‘”mullet boat”, especially since the Mullet Boat Association itself now sponsors the concept that unballasted out-and-out racing 16 footers are “mullet boats”. And that makes it pretty official, don’t it? 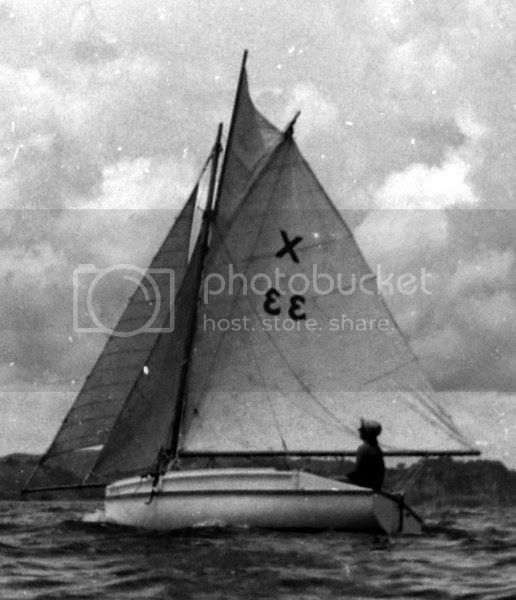 The Ponsonby Regatta Committee which established the mullet boat classes in 1903 recognised only 3 classes of restricted design mullet boats, the 22 footers, the 24 footers and the 26 footers. The 20 footers were recognised (grudgingly) in 1909. Anything shorter than 20 ft was NOT a mullet boat according to those stodgy old chaps who were reactionary and stupid enough to believe that they were protecting the purity of the true working mullet boat as a unique indigenous yacht of great racing performance and cruising capability. How elitist! In these much more enlightened times, who knows how long it will be before the M Class becomes an “18 ft mullet boat” and an Idle Along is also rebranded as a “bona fide 12ft 8in mullet boat”…and then it’s only a baby step to include the P Class, as a “bona fide 7 foot mullet boat”? We live in interesting times. Arch Logan, Alf Harvey and Harry Highet would have had kittens of course, but they had never Twittered or spent most of their waking hours on Facebook, had they? Still, one can’t help wondering what size catch of mullet a 16 footer, or a P Class for that matter, would bring back to the Queen Street wharf to sell to the eager citizens of our glamorous new city? Waitemata Woody’s does it for me. The dub dubs. Hoots mon! As the guy holding the tiller in the IA – i think of it more as a 360 pirouette than a wipe out… (i.e. stayed upright). Great photos. Yes it was a great day, thanks for the photos. Mullet boat results were 1st on line, and on handicap,Orion. 2nd on handicap TaoToo, 3rd Rangi Manu. The IA broke her tiller while screaming down the harbour with her spinnaker up, she did a spectacular wipe out and was towed back by the PCC Rescueboat. And of course one M-class. Well we all knew THAT wasn’t a mullet boat didn’t we, sportsfans?.